Promotion: Ballantine’s Core - ‘Show us how you like to enjoy Ballantine’s Finest’. Territory: Open only to legal U.S. residents of AK, AR, AZ, CA, CO, CT, DE, FL, GA, HI, ID, IL, IN, KS, KY, LA, MA, MD, ME, MI, MN, MO, NC, ND, NE, NJ, NM, NH, NV, NY, OH, OK, OR, PA, RI, SC, SD, TN, TX, UT, VA WA, WI and WV, 21+ years of age. Entry Mechanism: General Activation - Entrants must answer the following question ‘Show us how you like to enjoy Ballantine’s Finest’ (e.g. enjoying with friends, having fun at a retail location, etc.) by submitting photographs and videos demonstrating their answer - via the Facebook, Instagram or via email to alexis@frontpaigecs.com. 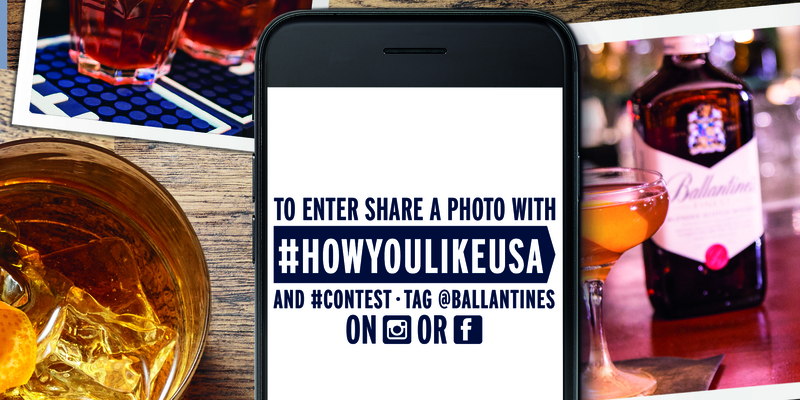 a) Entrants must log on to their Instagram account (or create one for free), then upload a photo of their favorite way to enjoy Ballantine’s including the hashtags #howyoulikeUSA and #contest to be entered into the competition. b) Entrants must log on to their Facebook account (or create one for free), then upload a photo of their favorite way to enjoy Ballantine’s including the hashtag #howyoulikeUSA and #contest and tagging the Ballantine’s Facebook Page @ballantines to be entered into the competition. - Photo cannot describe or depict any illegal activity or violation of any state or federal law. - All individuals in the photo must be 21 years of age or older (if an individual other than the person entering the Contest is prominently featured in a photo, the person entering the contest must obtain express written permission to be featured in the photo from each person who is featured). Prize Selection: Entries will be judged by a panel of three (3) representatives of Ballantine’s who will select the Grand Prize winners based on the following equally weighted criteria: creativity, adherence to the assignment (showcasing how you like to drink Ballantine’s), composition of photograph/video; quality of photograph; compliance with brand image; and originality of interpretation. At the end of each week between the Start Date and the Closing Date (the “Contest Period”), the eligible entries received during the preceding week will be judged by the panel of judges based on the judging criteria described above. The eligible entry that receives the highest score from the judges for that week will be deemed the Grand Prize winner for that week. Decisions of the judging panel shall be binding, final and cannot be appealed. Prize(s): There will be Fifty (50) Grand Prizes: Each Grand Prize shall consist of one (1) Block Outdoor Waterproof Bluetooth Speaker. Approximate Retail Value (ARV) of each Grand Prize: $27.75. Total ARV of all Prizes: $1,387.50. Selection Timeframe: Potential winners will be selected by the end of each Monday during the Contest Period (3/1/19-10/31/19). Notification Date: Potential winners will be selected by the end of each Monday during Contest Period. 1. Your entry to the Promotion is governed by these Terms and Condition. By entering into the Promotion, you accept these Terms and Conditions and agree to abide by them, including any modifications. 2. These Terms and Conditions prevail in the event of any conflict of inconsistency with any other communications, including advertising or promotional materials. 3. This Promotion is only open to residents in the Territory and entry must be submitted from within the Territory. d) fulfil all Entry Requirements before the Closing Date. 5. Officers, directors and employees of the Administrator, Sponsor, their parents, subsidiaries, and affiliates; individuals or entities responsible for the development, printing, distribution and implementation of this Promotion; suppliers, distributors and retailers of alcohol-beverage products; and individuals who are employees of or members of the immediate family or household of any of the foregoing are not eligible. 6. Only one entry per person per week will be considered for the Promotion. If more than one entry is received from the same person or from a different Instagram account by the same person, all such entries will be disqualified and only the first entry will be accepted as an entry into the Promotion. 7. No entries from agents, third parties, syndicates, organized groups or entries automatically generated by a computer, program, application, script or any automatic method will be accepted. 8. No payment or purchase is necessary to enter or win. A payment or purchase will not improve your chances of winning. 9. Entries received after the Closing Date will not be considered. 10. To enter this Promotion, you must access Instagram, Facebook or email to fulfil the Entry Requirements before the Closing Date. 11. Entries must comply with these Terms and Conditions. 12. Where the Entry Requirements require you to upload a picture or video (“Submission”), your Submission must be your own work. By entering the Promotion, the entrant represents, acknowledges and warrants that any Submission is your original work created solely by you and that the Submission does not infringe on the copyrights, trademarks, moral rights, rights of privacy/publicity or intellectual property rights of any person or entity, and that no other party has any right, title, claim or interest in the Submission. You must also have the consent of anyone featured in the Submission to upload it to the Promotion. All Submissions must comply with our User Content Policy (see Appendix where all key aspects are re-iterated). We reserve the right to reject any entry which does not comply with these Terms and Conditions or our User Content Policy. 13. Your Submission must not, inter alia, be offensive, discriminatory towards any gender, race or religion, or be obscene in any way and must not promote excessive or underage consumption of alcohol or the consumption of alcohol when pregnant. Any Comment(s) likely to be considered offensive or likely to reflect negatively on the name, reputation, or goodwill of Ballantine’s or any of our affiliate brands shall be ignored or blocked and your Entry shall be disqualified. All Comment(s) must comply with our User Content Policy (see Appendix where all key aspects are reiterated). By entering the Promotion, the entrant accepts full responsibility for any Comment(s) published from their own Instagram account for the Promotion. We reserve the right to reject any entry which does not comply with these Terms and Conditions and/or our User Content Policy. 14. Entries which are in breach of any of the above requirements will be disqualified and removed by the Administrator. 15. Incomplete, illegal, undelivered, stolen, misdirected or late entries or entries not of decent standard or in accordance with these Terms and Conditions or the Content User Policy will not be accepted. 16. The Administrator shall be the sole judge of which entries are valid entries and the result of the Prize Selection is final. No correspondence will be entered into. 17. The Administrator reserves the right at its sole and absolute discretion to disqualify any individual deemed to be ineligible, found to be attempting to circumvent the Promotion by tampering with the operation of the Promotion, setting up multiple accounts, using multiple identities, or acting in a manner deemed by the Administrator to be in violation of the terms and conditions and where necessary, to undertake all such action as is reasonable to protect itself against such fraudulent or invalid entries including, without limitation, to require further verification as to the identity, age, and other relevant details of an entrant and their entry. 18. The Administrator accepts no responsibility for failure or delay to receive an entry where such failure is due to circumstances outside the Administrator’s control. The potential winner of the Prize shall be selected via the Prize Selection within the Selection Timeframe. The Notification will be send by the Administrator by the Notification Date (estimated). The Administrator will make reasonable efforts to contact the potential winner. The Administrator is not responsible for unsuccessful efforts to notify any potential winner. In order to be awarded the Prize, the potential winner must respond to the Notification within seven (7) business days of initial notification and shall fulfill all requirements detailed in the Notification within this timeframe. Requirements which may be detailed within the message may include, <i>inter alia</i>, confirmation/proof of the potential winner’s identification and age, as well as details of the address the Prize shall be sent to. If requested, the potential winner may be required to sign documentation unless prohibited by law in their jurisdiction of residence within seven (7) business days of initial notification. For the avoidance of doubt, initial notification shall be taken to mean the day on which the Notification is sent by the Administrator to the potential winner. The Notification shall be sent no later than the foregoing Notification Date. If the potential winner fails to respond to, or fails to fulfill the requirements detailed by the Administrator in the Notification within the timeframe, or they reject the Prize, the potential winner will be disqualified, the Prize forfeited and an alternative potential winner selected in the same manner as the original. If any prospective potential winner is found to be ineligible for any reason or non-compliant with these Terms and Conditions, it will result in disqualification and the Prize will be awarded to an alternative potential winner under the same terms as above. Participants are encouraged to check their email/Instagram/Facebook inbox regularly during the period between the Closing Date and the Notification Date to ensure that they do not miss Notification from the Administrator. Once the potential winner has fulfilled all requirements detailed in the Notification, delivery of the Prize shall be organized, and the winner will be publicly announced on Instagram or Facebook. The winner(s) of the Promotion shall be awarded the Prize. The winner(s) is responsible for assessing its tax implications and paying any tax due or owing on the Prize(s) received. A cash alternative is not available for the Prize. The Prize(s) is not assignable or transferable. No transfers or substitutions are permitted except that the Sponsor reserves the rights to substitute a prize(s) of equal or greater value due to unavailability or otherwise in its sole and absolute discretion. By entering the Promotion, you accept the Sponsor and/or Administrator may require you to participate in related publicity, including the use of your name and your country of residence on the Ballantine’s website, Facebook, Twitter and Instagram accounts and in any promotional material connected to this Promotion and for the winner’s personal Instagram profile to be tagged on these social media platforms. If you do not wish to participate in such publicity please advise the Administrator when accepting your Prize. By entering the Promotion, each entrant irrevocably grants to the Sponsor, Administrator and their affiliates, assignees, agents and licensees, the unconditional, worldwide and perpetual right and permission to (as appropriate), reproduce, alter, encode, store, copy, transmit, publish, post, display, adapt, exhibit and/or otherwise use or reuse in whole or in part (without limitation as to when or to the number of times used), in commerce and in any and all media worldwide now known or hereinafter developed, for a period of three (3) years without further consideration or notice to the entrant, their Submission, as well as any additional photographic images or other materials relating to you arising out of your participation in the Promotion (with or without using your name) on its digital platforms (including the Ballantine’s website and all social networks used including Facebook, YouTube, Instagram, Twitter, Pinterest blogs and online advertising, banners and emails) always in connection with the advertising and marketing of the Promotion. You also warrant that any “moral rights” in your Submission shave been irrevocably waived in favor of the Sponsor. The Sponsor, Administrator and their associated companies, agents, contractors and sponsors, to the fullest extent permitted by law, assume no liability whatsoever for any direct or indirect damage, loss, or any injury suffered by any entrant participating in the Promotion or as a result of accepting any Prize(s), or the use or disclosure of an entrant’s Submission or Information. Nothing shall exclude the Administrator’s liability for death or personal injury as a result of its negligence. In the event of exceptional circumstances outside its reasonable control, the Sponsor reserves the right to cancel or amend the Promotion or these Terms and Conditions at any stage but will always endeavor to minimize the effect to entrants in order to avoid undue disappointment. The Administrator’s decisions regarding winners selection is final and binding in all respects. To ensure fairness and integrity of the Promotion to all entrants, the Administrator will not enter into discussion regarding the running of this Promotion via public pages on Instagram, but may respond to questions via private message on Instagram. This Promotion is in no way sponsored, endorsed or administered by, or associated with Facebook or Instagram. Facebook and Instagram shall not be liable for any loss, damage or liability caused by matters relating to this Promotion. By participating in this Promotion you agree to a complete release of Instagram and Facebook from any claims and you understand that you are providing your Information to the Administrator, and not Instagram or Facebook. Furthermore, any questions, comments or complaints regarding the Promotion should be directed to the Administrator, not Instagram or Facebook. The Promotion is void where prohibited or restricted by law. The Promotion and these Terms and Conditions (and any non-contractual issues which arise out of or in connection with them) will be governed by the laws of the participating country but any dispute as to the meaning of these terms and conditions will be subject to the exclusive jurisdiction of the United States federal courts in the state of Kentucky. n) features any third party logos or other material without consent or persons who have not consented. i) Depict, and cannot itself be in, violation of any law. j) Any inappropriate or offensive material may be reported to the appropriate authorities. e) The entrant grants the Administrator a non-exclusive, worldwide, irrevocable, sub-licensable, transferrable, royalty free basis license to use, reproduce, distribute, prepare derivative works of or display the photograph/video. For clarity the entrant retains all ownership rights in the photograph/video. f) The entrant takes full responsibility for, and confirms that any Comment published from their Instagram or Facebook account has been written by the entrant themselves and does not infringe the User Content policy by being, inter alia, offensive, discriminatory or obscene in anyway.